Say hello to 16-year old Ellie Carter. 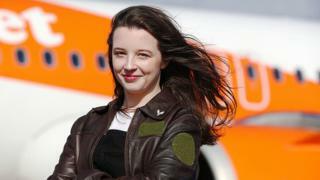 Ellie hit headlines in January 2019 after she became the youngest pilot of a one-person aircraft in Britain. We first met Ellie when she was given the task of helping to guide the plane down safely at the Royal International Air Tattoo at the Fairford Air Show. 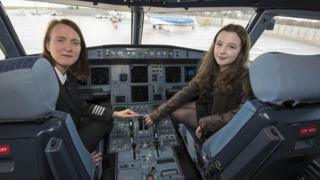 Now her hopes of making a career as a pilot has been given a boost after the airline company EasyJet offered her time with a mentor - Training Captain Zoe Ebrey. Are there enough female pilots? Just one in 20 of the world's pilots are women. So attracting and supporting young women into the profession is part of the airline's plan. Ellie says: "I've been interested in the physics and powered flight from as young as I can remember. Flying absolutely amazes me and continues to surprise me." "I hope that my story will encourage young girls to accomplish whatever they set their mind to, because if I can do it, so can they." So what kind of pilot does Ellie want to be? Ellie says she's interested becoming a U2 Dragon Lady pilot, which is part of a secret aerial reconnaissance squad in the US Air Force, being a a pilot instructor or even being a stunt pilot. These are all things for Ellie to explore over the next year. Aeroplane acrobatics - a pilot's-eye view! Wow! Well done Ellie! Your story is so inspiring! Good luck!